Hewlet Packard has officially unveiled its HP Pavilion Slimline S5100 Desktop – with the tiny PC promising to offer a big performance. 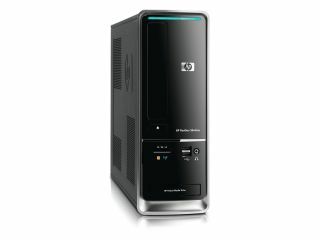 With small form-factor PCs growing in popularity, HP is offering what it terms a "stylish and space-efficient desktop PC that provides all the performance and functionality of a traditional tower PC but in less than half the size". The PC can ship with either Vista Home Premium or Ultimate, is powered by Intel Quad Core 2 Quad or Phenom II X4 processors and has built in 802.11 WiFi – with an internal antenna to keep things neat. "The HP Pavilion Slimline s5100 PC is a great full-function performance PC that will appeal to young-minded, style-conscious consumers," said HP's Charl Snyman. "For those looking for a stylish PC solution that fits practically anywhere in the home and can accomplish any mainstream task required, the powerful, space-efficient HP Pavilion Slimline is the answer." We've asked for amore detailed look at the available specs, but the most basic model will weigh in at £339 and will be available from late July this year.